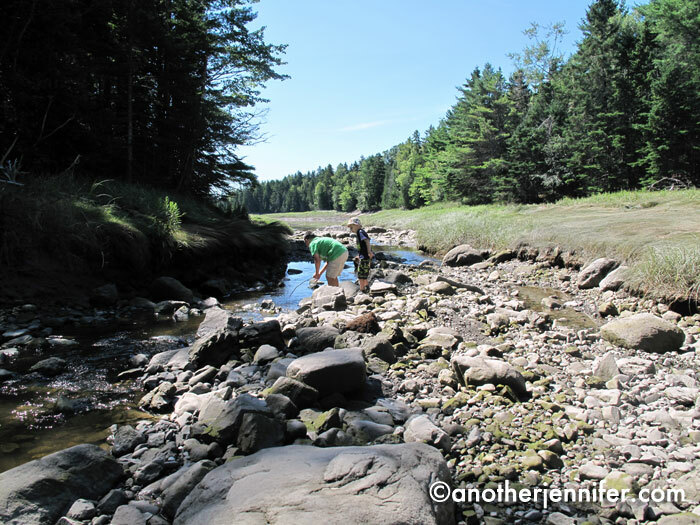 When we planned our camping trip to Cobscook Bay State Park in the beginning of the summer, we assumed we wouldn’t have much of a connection to the outside world while we were there. Located in the easternmost part of Maine (and the United States as a whole), my phone assumed I was in Canada as soon as we pulled our car into the park ranger station. My trusty iPhone switched over to Atlantic time, and Verizon sent me a text reminding me of the charges I would incur if I used my phone while roaming. Not that it mattered. We had no service at the campground or in most places we visited, and we left 3G behind somewhere near Bar Harbor. My husband and I enjoy real camping in a tent with as little amenities as possible. We look for places with vast woods where we can’t see our neighbors and don’t offer things like a pool or mini golf. We want campfires in the morning and at night to keep us warm and cook our food. We want hiking trails to enjoy with our dogs that were born to travel long distances. We want a place for our kids to get dirty and pee freely in the woods (my kids probably want this more than I do). Instead of getting work done on my laptop during the 4+ hour drive to get to the park, I read a book (made of paper) and enjoyed the scenery outside my window. Instead of hanging out in a hotel room, I watched the tide roll in and out from my campsite and noted how the light changed throughout the day. 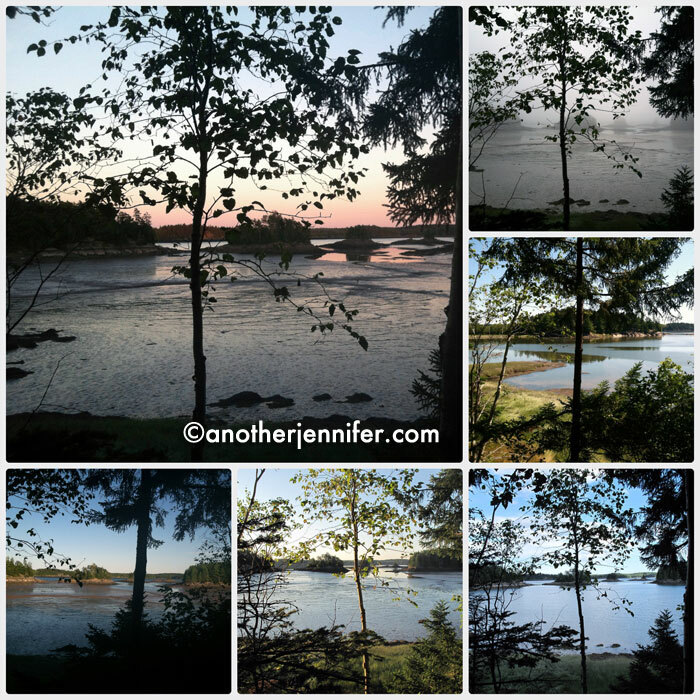 The view from our campsite at Cobscook Bay State Park in Dennysville, Maine. 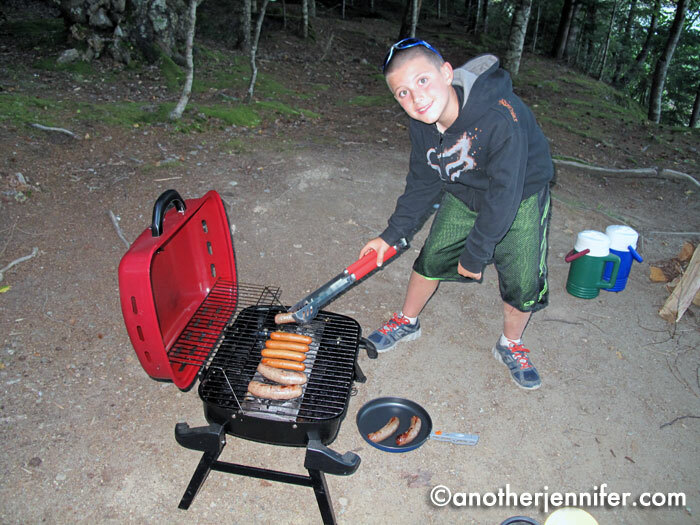 Instead of eating in restaurants, my husband and son cooked gourmet meals over campfire and our travel grill and stove. G got to do some cooking with Dad while we camped. He even planned our menu for the week, which included homemade granola bars, chicken kabobs, steak on a stick and roasted chicken and veggies. Instead of having my head in my phone at night, I craned my neck to count shooting stars. Instead of playing on their tablets, the kids used the firepit to make a steel drum. Instead of watching television, we played Yahtzee by the campfire. 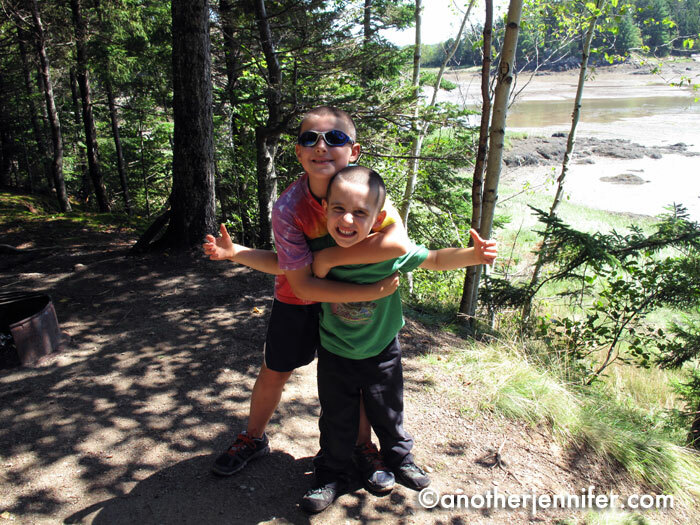 Instead of shopping in town, we hiked the challenging “nature trail” and played in a creek. We found this fun creek to play in at the end of our hike in the woods. 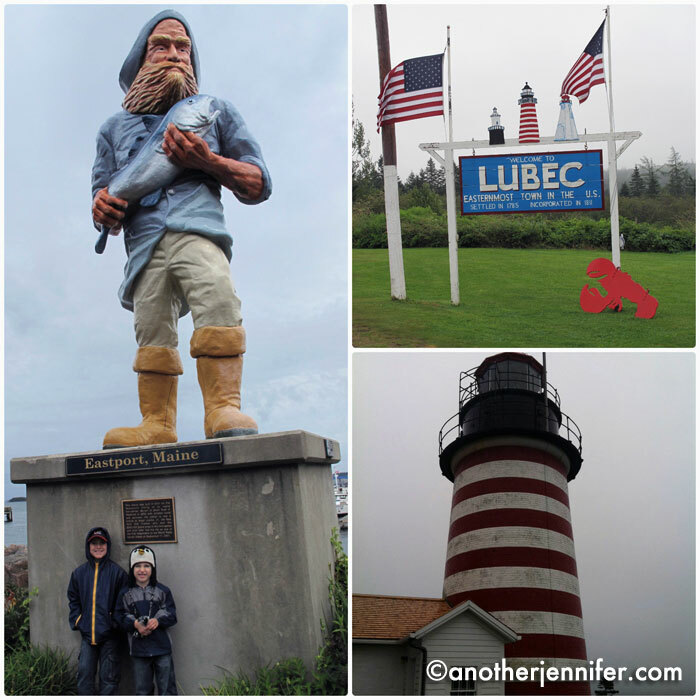 We visited the towns of Eastport and Lubec while it rained. We even crossed over to Canada for a short visit Campobello Island. Instead of leaving in the big rain storm the last night, we secured the tent and made do as Kailua kept the tent from flying away. Kailua is a great camping dog. Plus he held our tent down when the rain poured and the wind whipped through the park overnight. Some people think camping is crazy. My husband noted that many of his friends told him their wives would never go camping. A friend told me his idea of camping was staying at a 2-star hotel. Because sometimes you need to unplug and just be. Being in the woods and living simply for a few days clears your mind and shows you what’s important in your life. I probably wouldn’t last much more than the four nights we stayed in Cobscook Bay State Park. By the end, I was getting pretty itchy from the mosquitos and lack of hot showers. But I noticed my kids hugged me and told me they loved me more times than they normally do when we left. Their favorite part of camping? Throwing rocks into the ocean and peeing on the campfire to put it out. That’s why I love camping. If you need me this week, I’ll be answering emails, enjoying hot showers, doing laundry and attempting to convince my kids to pee indoors. AW! So glad that you had a great experience and it was all you wanted it to be! Do I like camping…no. I don’t even like to stay at hotels without room service. True story. When I was 17, I spent a summer in Israel which included several weeks working on a Kibbutz with living accommodations that were just about the same as camping – maybe even worse? I have never had the desire to camp since that experience! It was too primitive and too forced. BUT – when you mention all of that quality time with your kids and family togetherness, and reading and looking at shooting stars, I *may* give it a second thought now. Doing this with my family versus a bunch of 17 year old coeds may be the game changer! Welcome back! I’d call except I want to give you plenty of time to take hot showers and get through email first! The stars. Seriously, the stars. When you are that far out and without any buildings or other light to interfere, it is just amazing to see. I’ve never seen so many shooting stars in my life. It almost looked fake! Your experience sounds pretty amazing. We have a very extensive camping checklist that we go through to make sure we have everything we need to stay comfortable. Something as simple as forgetting a broom can mess up the whole experience (literally)! For some reason, I’m just now noticing your last sentence. I’m still not through all my emails! Feel free to call any time. I know you’ll be leaving soon. So exciting! Beautiful spot! We love camping. In a few weeks we’ll do our annual friends camping trip. Four families and so much fun! That’s awesome, Lisa. Camping with friends is always a blast. Fun times by the campfire, for sure! Enjoy your trip! Sadly, I’m wish Lisa – hotels, please. My husband is probably worse than I am so neither of us cramping each other’s wild spirited style or anything like that. That said, I did get wistful for what you described. I may need mine in an air-conditioned cabin, but I need a simpler vacation just the same. I should have mentioned the good wine and coffee I sipped in the evenings and in the mornings. Does that help? 🙂 And we had no need for air conditioning out there. I wore pants and sweatshirts most of the time and didn’t break a sweat even when we hiked. Besides the driving rain that one day, it was pretty great. So did you guys get totally drenched or did your tent stay dry? It sounds wonderful and amazing. we all need to unplug and get away. The pics are beautiful. My husband really wants to take a real camping trip. I’d like to try a very short one first to see how it goes! The tent stayed dry. We make sure we have good gear to go camping with. The problem was that on the last night it was so rainy and windy that some of the tent was blowing up in one corner. It was just a pocket of air that was getting under the tent, which Kailua stopped with his body. I sat there wondering what to do about the area, and he just laid down and settled for the night. He was wet from one small section where water seeped through, but he didn’t care. 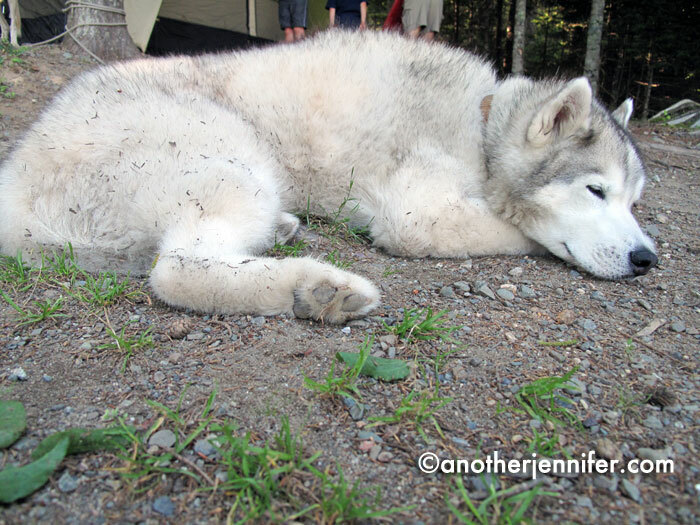 It pays to have an outdoor dog when camping! Matt actually had to go outside in the middle of the night and secure a peg that came out of the ground. The wind was so eery, you could hear it come from one end of the park to the other. Luckily, the kids slept through that part. Camping is totally not my thing. Going to Camp absolutely is though! I like being in nature, but with a roof, water and a wood stove. I commend your ability to really “rough it” and it sounds like it was a good time (if you’re into that). Welcome back! I camped a lot when I was younger, but now I have a harder time with it and prefer hotels:). But, I do love the nature aspect of it and the way you can really unplug. You can get some amazing quality time around a campfire, but I’d prefer to head to bed in a little cottage! Looks like you guy had a great time in a beautiful location! I love all the stuff you talked about. But I just cannot sleep outside. And I need my warm shower. I am a big wuss. I will admit it. I’m so glad you had a great time though, and I love your pictures! Thanks, Michelle. I either have to rough it or be in a really nice hotel. I don’t like anything in between! So when I go camping, I like to go all out. The campground did have a “central shower area”, but it was not my cup of tea. Luckily it wasn’t hot and we were able to make do. I’m totally with you on the camping front – I’m not a fan of large campsites with amenities, either. Obo and I used to backpack before we had kids, and now that they’re old enough, we’ve started camping with them. Finding good, quiet camping places is a challenge if you’re not backpacking (which we’re not…yet) but always worth it. Luckily, you can find some good quiet areas in Maine. Once you get away from the touristy stuff, it’s pretty easy. The state parks here are great, as you probably know. Happy to find another camper! I figured you’d be a camping fan. You probably could have identified all the birds that would wake us up in the morning too. They were loud! Oh, and I started reading the Quarter Acre Farm book on the trip. I love it! Thanks for the recommendation.